(This is not an endorsement, as I use vintage pans, but they are available in new cast-iron, in five ear-, seven ear-, nine ear-, and even mini-versions, from Lodge https://secure.lodgemfg.com/storefront/product1_new.asp?menu=prologic&idProduct=3955). 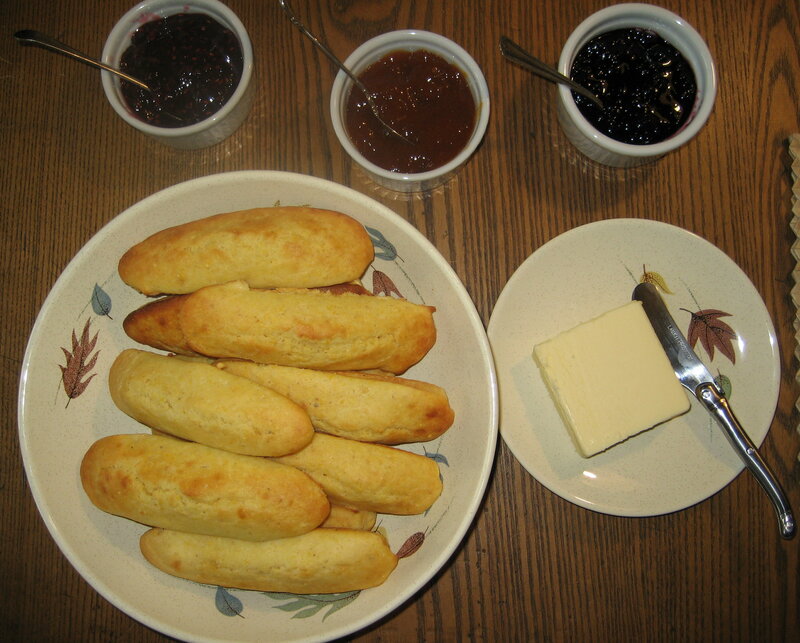 Cornsticks have greater surface area for jams, butter, et. al. While not totally different from corn muffins, they are easier to eat with one’s fingers, have a larger surface-area (compared to a standard muffin-top*), and feature exceptional textural contrast, from the smooth top to the corn-cob pattern underneath. For a post Xmas Sunday brunch, I whipped up a batch of cornsticks in my two vintage seven-ear pans. The following recipe makes exactly 14 cornsticks. 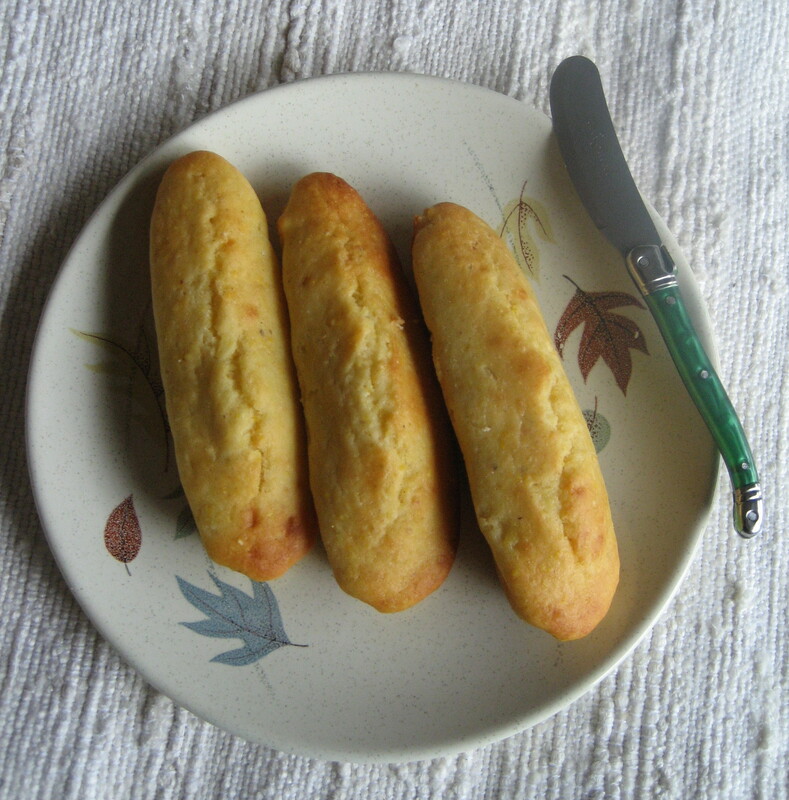 It is my standard one, adapted from one in the fantastic The Baker’s Dozen Cookbook, but with my changes of buttermilk (instead of milk) and two kinds of corn meal (instead of just corn flour), for a tantalizing textural treat. The reverse sides shows the corn-cob texture. 1. 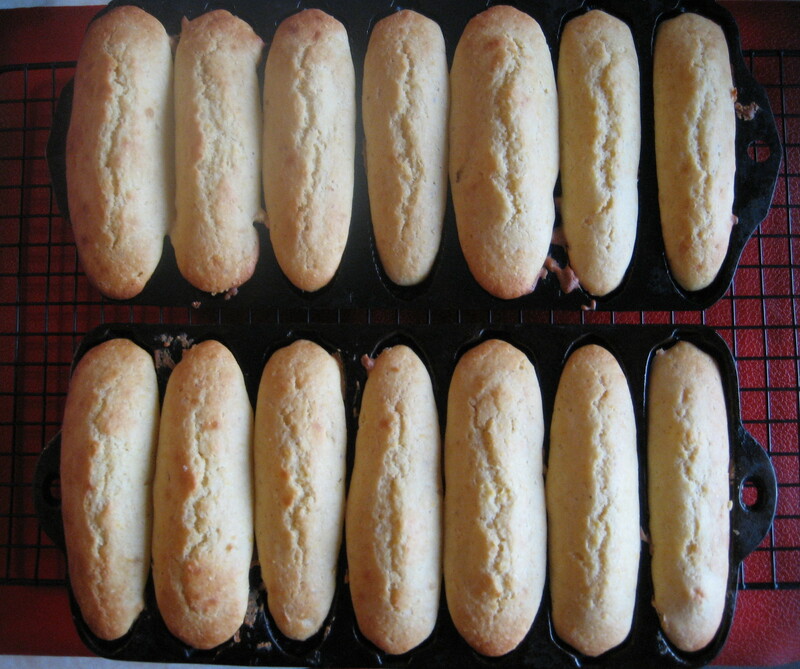 After greasing the cornstick pans with shortening or butter, position cornstick pans on a rack in the centre of the oven. Preheat to 375°F, while preparing the recipe. 2. Whisk flour, cornmeal, sugar, baking powder, and salt together in a bowl (or sift together, if you feel so compelled, for tradition’s sake). 3. In a large bowl, whisk the eggs just until broken up. Add melted butter, oil, and buttermilk and whisk again until blended. Adding flour mixture to the liquids, stir with a wooden spoon – for traditionalists – or a handy, wide, rubber silicon spatula, until moistened or just until blended. The batter will be slightly lumpy. Do not stir excessively. 4. Pour the batter into the hot cornstick pans with a spoon or 1/3 cup measure (about the right volume for one cornstick). Smooth the tops with an offset spatula, wooden spoon, or knife. 5. Bake until the top of the bread looks dry and slightly golden. 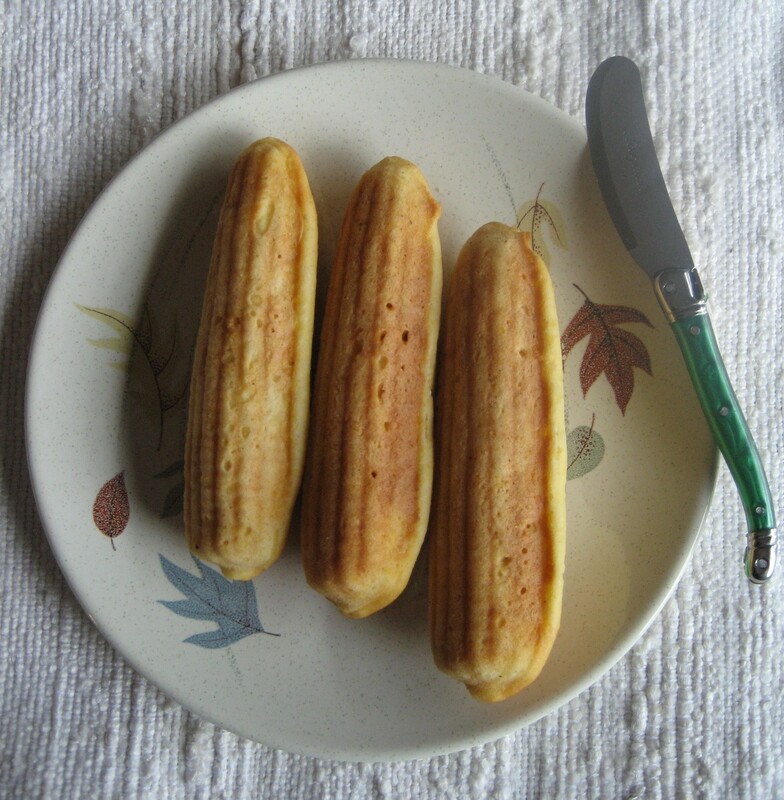 The centre of a cornstick springs back, when pressed gently with your fingers, after about 15-20 minutes. 6. Transfer to a wire cooling rack and let stand for five minutes. 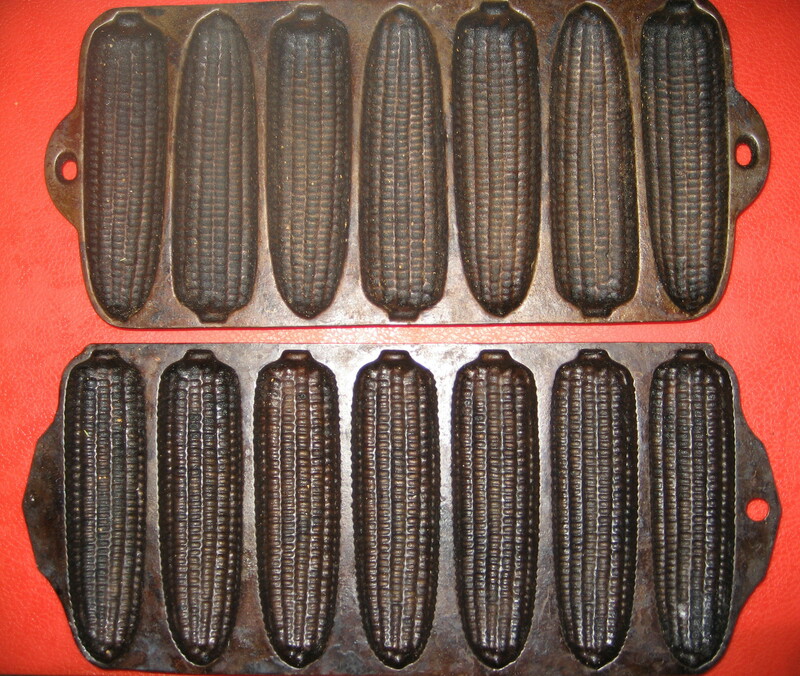 Cornsticks, fresh from the oven, cooling on a rack. * The cornstick is about 5″ long x 1.6″ wide (on average). This means 8″ of surface area. A muffin-top (no, I am not talking about the slangy, fleshy kind: http://en.wikipedia.org/wiki/Muffin_top ) for a standard 3″ muffin (pi x R-squared = approximately 7″) For any math geeks who will question this, yes, a significantly-domed muffin could have more surface area than the figure I’m using, but, really, now, we’re just talkin’ baked goods here…. This entry was posted in Brunch and tagged Baking, Brunch, Muffins, Recipe. Bookmark the permalink.